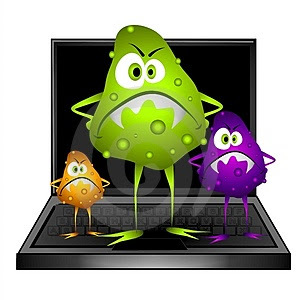 Viruses, spyware, malware - whatever name you may have for them, you know they're bad news. The reality is that you've probably misdiagnosed any problems on your PC as being virus-related. There was a time when viruses were just little annoying scripts that made your Microsoft Word go haywire, but now it's big business. Virus writers are in it for the money, your identity, and to wreak general havoc. If you're not careful, they'll get you too. In the computer repair and service business, viruses are something we see regularly. Generally people don't bring their computers in unless they've basically become paperweights, so we've seen the worst of them. But there are plenty of viruses that never let themselves be known, and that's by design. Ever heard of a keylogger? It's this nasty little bugger riding silently on your computer like the barnacles on a whale recording your every keystroke and sending it back to its master. Yup, I see the light bulb shining over your head now as you realize how those jokers hacked into your myspace account, and spammed all the friends you've never actually met. How can you avoid this kind of scenario? Well, this is really a matter of an ounce of prevention being better than a pound of cure. Get yourself a good, commercial Anti-Virus and keep it up-to-date. Many of you are giving yourself a false sense of security by using any of the number of free anti-virus products out there, but I've got to tell you that you're getting exactly what you pay for. We routinely see systems with free or even inferior commercial (cough, Norton, cough) anti-virus products come in with the worst of virus infections. There are a few good products out there, but the one we've found to give you the best bang for your buck is Kaspersky Anti-Virus. It's got a whopping 98% detection rate and doesn't slow your system to a crawl while it's doing it's thing. In fact, when we set people up with Kaspersky we give them a 1-year no virus guarantee. That's how confident we are with the product. Regardless of which anti-virus product you choose, a little common sense goes a long way towards avoiding viruses. Keep your system up to date using the latest software updates from Microsoft. Make sure you have a sound backup strategy. Use a browser other than Internet Explorer. Since it's the most popular and widely exploited browser in the world, an alternative like Firefox or Google Chrome will help protect you from at least half of the viruses out there that specifically target IE users. Don't download pirated software, music, or movies and stay away from "questionable" websites. But just as in life, doing all the right things doesn't necessarily keep you safe. Let's say you get a virus, now what? Fear not Dear Reader because there's no computer FDA or corrupt drug company preventing your computer from getting well. For eve ry computer virus there is a known cure. Even if that cure means reinstalling your operating system. Now for a serious virus infection, your standard virus protection isn't going to really help. Any virus writer these days makes sure once their virus lands on your system, it's going to disable any anti-virus you've got running. What you'll most likely have to do is restart Windows in safe mode with networking. Do this by rebooting and pressing the F8 key before Windows starts up. In safe mode, you'll be able to launch a virus scan with an alternate virus scanning tool, I prefer Malwarebytes. Once that completes, your viruses should be gone. Now granted, this is not a surefire recipe for all viruses, but for nasty suckers like the Windows Security Center fakeware pictured to the right, this is just the ticket. We have been seeing some viruses that won't even let you get rid of them in safe mode. Kaspersky has a bootable rescue disc that will let you start up outside Windows, and perform a scan without the virus interfering. If it's bad enough, you may well have to consult your neighborhood computer repair specialist. Look, a computer virus isn't the end of the world. If you do happen upon one, the Internet is a wealth of information as to how to rid yourself of the problem. I'd also recommend you change all your passwords since you don't know just how much of your data has been compromised. After you've rid yourself of this little nuisance, for the most part, common sense will help you avoid viruses altogether. Using Kaspersky or some other solid Anti-Virus product is the foundation, and having a solid backup is never a bad idea. Duh!